In a story elaborating on Luxury housing, The Tribune has featured Mr. Tanuj Shori’s quote. (Dated 06 April 2019). 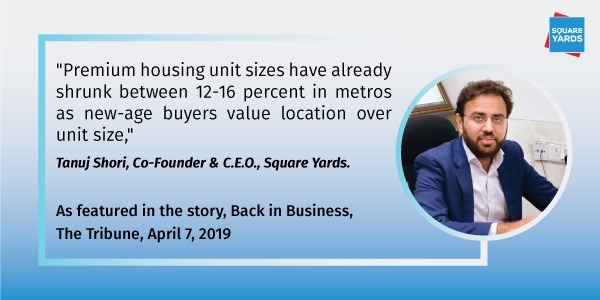 It mentions, ‘Tanuj Shori, Co-Founder & CEO, Square Yards, says that in line with this distinct trend, premium housing unit sizes have already shrunk between 12-16 % in metros as new-age buyers value location over unit size.’ According to market watchers, the housing market revival that started slowly in 2018, is expected to pick up pace by the end of this year.